This activity is a brief introduction to adaptations as the group observes a live organism together. Adaptations are inheritable structures and behaviors that help a group of organisms survive in their habitat. Students start out observing an organisms’ structures, trying to figure which might help it survive in its habitat and which are inheritable. Then, they do the same with behaviors: attempting to figure out which ones are behavioral adaptations. 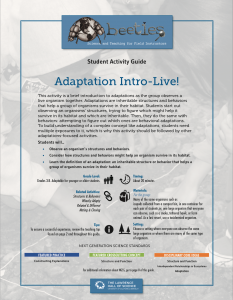 To build understanding of a complex concept like adaptations, students need multiple exposures to it, which is why this activity should be followed by other adaptations-focused activities. Observe an organism’s structures and behaviors. Consider how structures and behaviors might help an organism survive in its habitat. Learn the definition of an adaptation: an inheritable structure or behavior that helps a group of organisms survive in their habitat. a big, rotting tree carcass.